I'm currently working on the Maze socks from Sensation Knitted Socks for one of my brothers as a Xmas present. I've never done mosaic knitting, but this is really enjoyable. There is a small error in the written instructions for the maze pattern, but the charted design is correct. The other sock is one of my own design. I've decided to branch out a little and try something new. 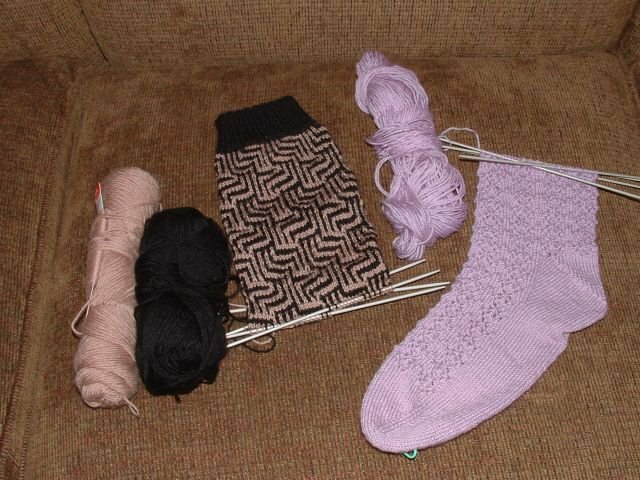 This is my first attempt at designing socks and I must remember to write this down. I love those socks. Isn't that book great? I've not made anything out of it yet, but it's fun to look at the pictures.